This astounding image from the Hubble space telescope captures the gradual destruction of an asteroid, forming a tail half-a-million miles long. It would take more than 12 trips around the entire world to match the length of the asteroid tail, as captured by NASA. There are roughly 800,000 known asteroids between Mars and Jupiter – and this photo captured one breaking up. 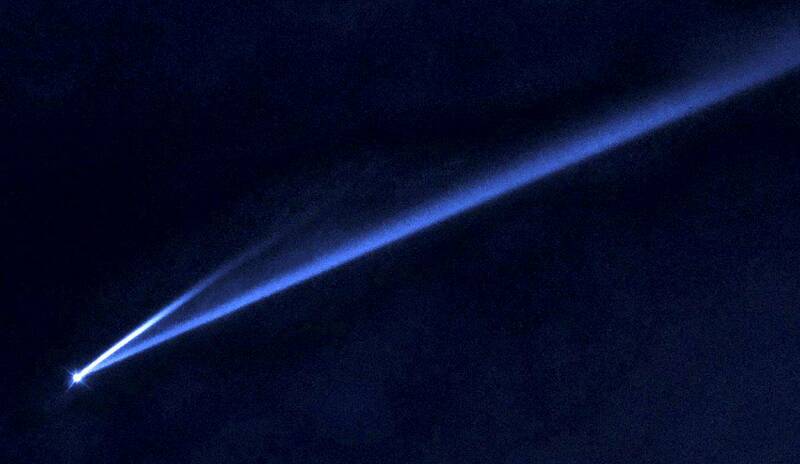 The Hubble Space Telescope image shows how dust has formed two trails, thought to happen just once a year. Each trail represents an episode where the asteroid gently shed its material – and will eventually disperse into space. Discovered in 1988, the 2.5-mile-wide asteroid has been observed repeatedly, but the debris ‘tails’ show its disintegration. Known as Gault, the asteroid is located 214 million miles from the Sun. One of the tails measures up to 3,000 miles wide. Dr Olivier Hainaut, of the European Southern Observatory in Germany, said the dust grains were the size of sand grains. And watching the asteroid spinning so fast it become ‘unglued’ gives astronomers the opportunity to study the makeup of these space rocks without sending a spacecraft to sample them. Dr Hainault said: “We didn’t have to go to Gault, we just had to look at the image of the streamers, and we can see all of the dust grains well-sorted by size. The asteroid’s narrow streamers suggest that the dust was released in short bursts, lasting anywhere from a few hours to a few days. When sunlight heats an asteroid, infrared radiation escaping from its warmed surface carries off angular momentum as well as heat. This process creates a tiny torque that can cause the asteroid to continually spin faster. Both tails will begin fading away in a few months as the dust disperses into interplanetary space.